The other pedestrian saves his life by watching the car from a distance after escaping what could have been an end to his life. 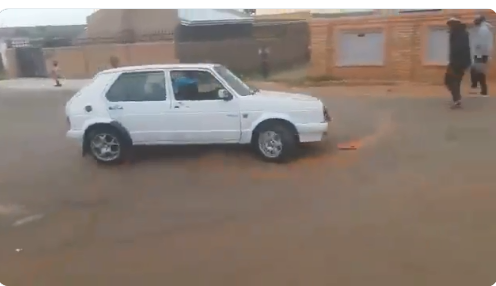 South Africans were outraged after a viral video on Twitter showed a driver hitting a pedestrian while spinning his white VW Golf on the streets, and then continued as if nothing had happened. In the video, the driver can be seen positioning his car for a spin, with the wipers on, but presumably miscalculates his position as, after accelerating, the rear end of his car hits one of two pedestrians walking on the other side of the road. The pedestrian lands on the road and remains motionless as a crowd of people quickly gathers around him, while another woman can be heard saying “shifta wena” along with a giggle from the person taking the video. It was unclear where and when the incident happened, though social media users have been circulating screen shots of the GP plate number in an attempt to find the driver.